Green beans, while quite low in calories (just 43.75 calories in a whole cup), are loaded with nutrients. An excellent source of vitamin K, vitamin C, manganese, vitamin A, dietary fiber, potassium, folate, and iron. And, green beans are a good source of magnesium, thiamin, riboflavin, copper, calcium, phosphorus, protein, omega-3 fatty acids and niacin. Beans have been an important part of the human diet for thousands of years. In fact, the Bible makes reference to bean consumption, and beans have even been found in pre-Columbian tombs and the Egyptian pyramids. It's been said that the Egyptians had temples dedicated to beans, worshipping them as a symbol of life. Most historians agree that beans are probably native to ancient Peru. From there, they were no doubt introduced throughout the world by soldiers who carried them as a staple of their diet as they fought ancient wars. The American bean story begins long before Columbus discovered America, with the American Indians as far south as Florida and as far north as the Red River Valley. In fact, maize, squash and beans were probably all cultivated in North America centuries before Columbus saw his first field of beans. North America presented a perfect climate for the successful cultivation of beans – plenty of rainfall and long, warm summers. As a result, by the late 1800's, American bean production had begun in earnest. 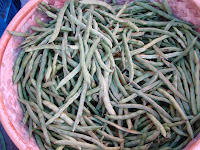 Initially centered in Michigan, by World War I the demand for bean products had attracted new growers in Colorado, New Mexico, Idaho, Montana, Nebraska and Wyoming. Green Beans are a good source of fiber and vitamin C and also contain calcium, magnesium, zinc and Vitamin A. Also is a source of folate which supports DNA synthesis and new cell formation.